Robert Lighthizer: "I'm hopeful. I think we are making progress. All three parties want to move forward." WASHINGTON — The top U.S. trade official says he's optimistic a NAFTA agreement could be reached soon, in a race against the clock to complete negotiations before political delays set in. 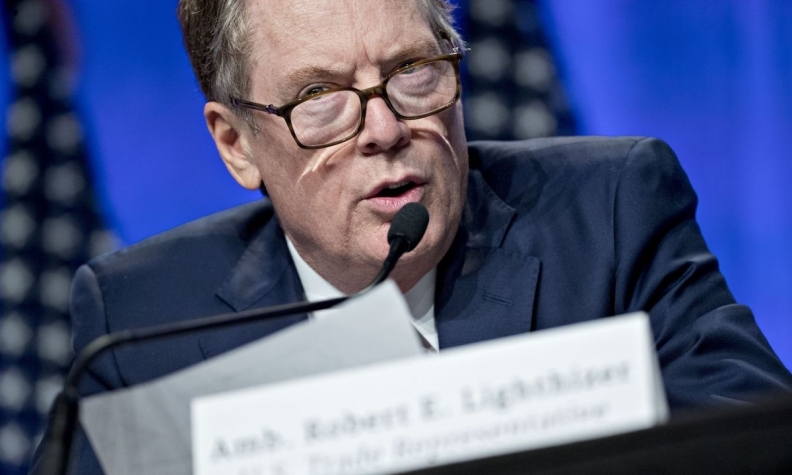 U.S. trade representative Robert Lighthizer made the remark in an interview on CNBC and cited forthcoming elections in Mexico and the U.S. Congress as the reason for the sudden rush. If there's no deal in the next several weeks, the Trump administration fears that those votes will kick the talks into 2019 and make it harder to reach an agreement. In an effort to get that deal, the U.S. appears to have backed away from one of its most contentious demands and is no longer insisting that 50 per cent of cars be made in the U.S., and is now floating a different formula based on autoworker salaries. "I'm hopeful. I think we are making progress. All three parties want to move forward," Lighthizer told CNBC on Wednesday. "If there's a real effort made to try to close out and to compromise and to do some of the things we all know we should do, I'm optimistic we can get something done, in principle, in the next little bit." An agreement in principle would allow the U.S. administration to launch a consultative process with Congress, which lasts more than six months before a ratification vote can be held. Beyond next month, it would become impossible for any deal to obtain ratification votes in 2018. Then early next year a new Congress will be sworn in, which could be controlled by the opposition Democrats depending on the result of midterm elections. In addition, Mexico will have a new president in December. Lighthizer alluded to the political pressure: "We have a short window because of elections and things beyond our control." Several sources say the U.S. has shaken up the talks with a new proposal on autos. In the early rounds, the Americans angered the other countries with a two-pronged proposal: on the one hand, to drastically increase the percentage of North American parts a car must have to avoid a tariff, but on the other hand insist half of a car's parts must be American. Other countries called that a non-starter. Now, according to sources familiar with the latest developments, the U.S. has offered to replace the 50-per-cent requirement with another idea designed to encourage American manufacturing: establish a formula that credits car companies for paying more than $15 per hour. That would, by definition, favour manufacturing in the northern part of the continent — because Mexican auto-workers' wages average only a few dollars per hour. Lighthizer has also said he's seeking policies that lift Mexican wages to discourage cheap-labour outsourcing; he has mentioned, as one example, reforms to collective-bargaining procedures. But one analyst cites reasons for skepticism. Jeff Rubin, a senior fellow at the Centre for International Governance Innovation and former chief economist at CIBC World Markets, said the details matter here. For example, some auto companies have warned that if NAFTA rules become too onerous they could just ignore them and pay the 2.5 per cent tariff to operate in the U.S.
Rubin notes that said the $15-an-hour proposal is about three times the salary of an average Mexican auto worker, and it's unclear the proposal will force companies to change behaviour. "Determining how meaningful this proposal is, or any other domestic content requirement, depends very much on the cost of non-compliance, which at this point remains trivial," he said. He also expressed doubt about the concept of embedding wage standards in a trade agreement: "It would establish a principle wage norm in free trade agreements, which is certainly outside the spirit of the World Trade Organization."